Mort Kunstler Handsigned & Numbered Limited Edition Artist Proof Print:"God Be With You"
Size: Image size: 16 1/2" x 30" - Overall size: 22 1/2" x 35"
About the Artist: He's the premier historical artist in America - and now he focuses mainly on the American Civil War. When Mort K�nstler began his current emphasis on Civil War art in the early 1980s, he had already accomplished more than a half-dozen artists could hope to accomplish in a collective lifetime. From portraits of prehistoric American life to the odyssey of the space shuttle, Mort K�nstler had painted America's story - and was already renowned as "the premier historical artist in America." 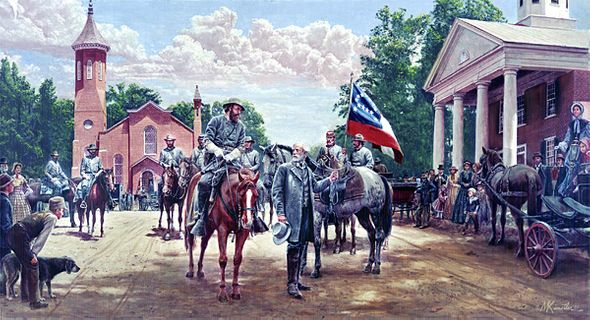 When he placed his focus on Civil War art, Mr. K�nstler quickly established himself as the country's most-collected Civil War artist, and earned unprecedented acclaim within the genre of Civil War art. "Mort K�nstler is the foremost Civil War artist of our time -- if not of all time," says Dr. James I. Robertson Jr., the dean of Civil War historians and the author of the celebrated biography, Stonewall Jackson. "To study his paintings," says Robertson, "is to simply see history alive." Pulitzer Prize-winning historian James McPherson concurs. "Of all the artists working in the Civil War field," he observes, "none captures the human element, the aura of leadership, the sense of being there and sharing in the drama, quite like Mort K�nstler. He has that enviable talent of being able to re-create history on canvas and to translate events into art."